The celebrated musical RODGERS + HAMMERSTEIN’S CINDERELLA is not the “Disney version” to which you might be used to. It was originally written for television in 1957 by the legendary musical theatre duo Richard Rodgers and Oscar Hammerstein II. Finally, this March Cinderella will make its Broadway debut with this new production: music by Richard Rodgers, lyrics by Oscar Hammerstein II, and a new book by four-time Tony nominee Douglas Carter Beane (Xandau, Sister Act), based on the original book by Oscar Hammerstein II. CINDERELLA is directed by Mark Brokaw (Cry Baby). The musical has choreography by Josh Rhodes, and music adaptation, supervision and arrangements by David Chase. Opening Night was Sunday, March 3, 2013. RODGERS + HAMMERSTEIN’S CINDERELLA, one of their most popular titles, was written for television, debuting in 1957 starring the legendary Julie Andrews (Sound of Music, Mary Poppins). This broadway performance marks the Broadway premiere for the beloved romantic musical. Leading the cast of RODGERS + HAMMERSTEIN’S CINDERELLA are Laura Osnes (Tony nomination Award for Frank Wildhorn’s BONNIE & CLYDE, SOUTH PACIFIC, ANYTHING GOES, GREASE) in the title role; Santino Fontana (THE IMPORTANCE OF BEING EARNEST, Drama Desk Award for BRIGHTON BEACH MEMOIRS , OBIE Award for SONS OF THE PROPHET) as the Prince; Victoria Clark (Tony, Drama Desk, and Outer Critics Circle Awards for THE LIGHT IN THE PIAZZA) as Marie, the fairy godmother; Harriet Harris (Tony and Drama Desk Awards for THOROUGHLY MODERN MILLIE, TV’s “Frasier” and “Desperate Housewives”); as Madame, Cinderella’s stepmother; Ann Harada(AVENUE Q, 9 TO 5, “Smash”) as stepsister Charlotte; Marla Mindelle(SISTER ACT, SOUTH PACIFIC) as stepsister Gabrielle; Peter Bartlett (THE DROWSY CHAPERONE, BEAUTY AND THE BEAST) as Sebastian, Prince Topher’s mentor and Lord Chancellor; Greg Hildreth (PETER AND THE STARCATCHER, BLOODY BLOODY ANDREW JACKSON) as the rebel Jean-Michel; and Phumzile Sojola (The Gershwin’s PORGY & BESS) as Lord Pinkleton. Jill Abramovitz, Kristine Bendul, Drew Franklin, Heidi Giberson, Stephanie Gibson, Shonica Gooden, Kendal Hartse, Robert Hartwell, Laura Irion, Adam Jepsen, Andy Jones, Andy Mills, Linda Mugleston, Alessa Neeck, Peter Nelson, Nick Spangler, Kirstin Tucker, Cody Williams, Branch Woodman and Kevin Worley complete the cast. In a sea of little princesses with their families and Cinderella fanatics of all ages, we sat in anticipation for the show. The frame of the elaborate set designed by Anna Louizos (High Fidelity, Avenue Q) stood tall before us, depicting a quiet forest for what would be Cinderella’s “Far Away Land”. The stage lighting (designed by Ken Posner) was dimmed to mirror the quiet of the forest. The room hummed a noisy buzz of people conversing, and little girls asking when the “Fairy Godmother” would appear. Soon, the lights dimmed, and the crowd went silent. The orchestra, conducted by Andy Einhorn and sound design by Nevin Steinberg, transported the crowd into the Fairy tale land. In Act One, the musical depicted the story of the unfortunate protagonist “Ella”, (or as her Stepmother liked to call her “Cinder Ella” for always sitting by the fire place) and her wicked family. 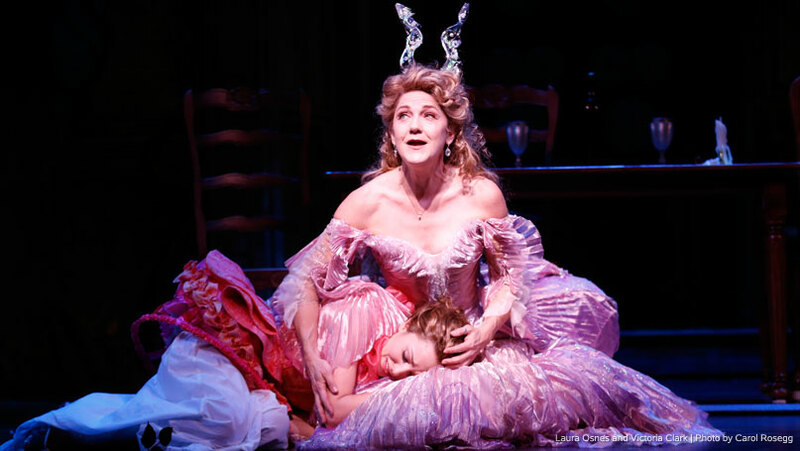 As Laura Osnes gives her sweet and innocent portrayal of Cinderella to the performance, Harriet Harris balances out the sugary sweet as the spicy Wicked Stepmother. Although already knowing the tale, we watched in anticipation the impeccable timing and dry humor of Harris, as well as the extremely lovable Osnes go head to head. One of the unexpected characters to shine through a highly talented cast was Victoria Clark, as Marie/the Fairy Godmother. Her vocal skills were impressive but did not steal away the spotlight from the main protagonist. As I looked around at the crowd watching the show, I couldn’t help but smile. Although it was expected for the little girls to be awestruck, their parents did not miss a beat either. With modern technology of onstage wardrobe changes, flying harnesses, and well rehearsed set transformations, Cinderella looked to be a tenured show running for years, not merely a month. With a few unexpected additions to the well versed story (don’t worry I won’t give away the spoilers), Rodgers+Hammerstein’s version is a fun adaptation. To have not one but TWO Balls, added a fun element to the story, as well as let Stepsisters Marla Mindelle and Ann Harada get a little bit of the spotlight. 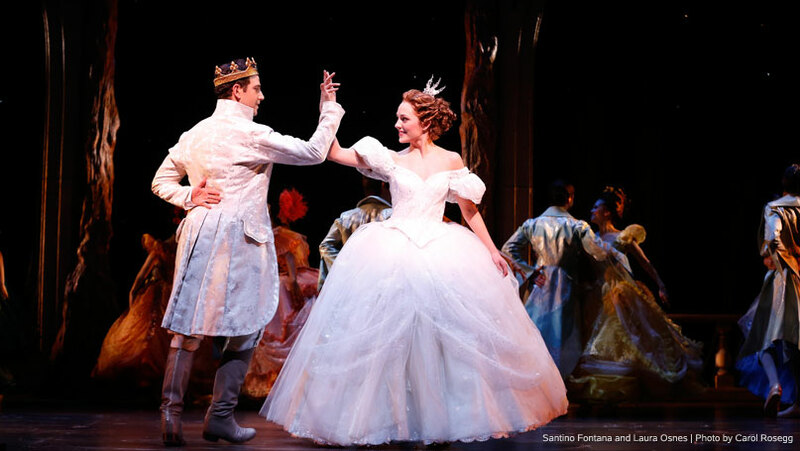 Santino Fontana’s Prince Charming showed a wide eyed sheltered boy match the innocence of dreamy eyed Cinderella. Their duet “Ten Minutes Ago” was one of my favorite numbers, while also being the pivotal number for the “love at first sight” theory. In all, Cinderella is a fun, family and adult friendly musical. Whether old or young you are transported back to the days of dreaming about your own “Prince Charming”. The beautiful sets, lighting, costumes, and scores give breath to the musical and the two hours passes by faster than expected. Some of the musical is tailored more towards a younger audience, but it does not hinder the obvious talent of the cast and designers. RODGERS + HAMMERSTEIN’S CINDERELLA is presented on Broadway by Robyn Goodman, Jill Furman, Stephen Kocis, Edward Walson, Venetian Glass Productions, The Araca Group, Luigi and Rose Caiola, Roy Furman, Walter S. Grossman, Peter W. May/Sanford Robertson, Glass Slipper Productions LLC/Eric Schmidt, Ted Liebowitz/James Spry and Center Theatre Group. Lawrence C. Salameno is the associate producer. Tickets to RODGERS + HAMMERSTEIN’S CINDERELLA can be purchased by calling Tele-charge at 212 239 6200 or online here.